Here are some new pictures of Jake to show you how great he looks and how well he is doing. And to thank you once again for the joy and love of our life, Pretty Boy Jake. As in the last email, Jake graduated Basic obedience class with Honors and he is an outstanding CANINE CITIZEN. Everyone just loves him. Out of our pack of 4, Jake is our gentle giant and the PEACE MAKER. Note from Rescue: Some pictures should be paintings, they're so beautiful. Puppy Huey is growing up fast! He and his 'brother' Andy are getting along great and they play non stop. Thank you Alison (the human) and Andy (the canine) for taking this little fur ball into your lives. Coco (formerly Brandy) looks like one happy girl with her beautiful 'playmate' Olivia. We love pictures of our shepherds with kids! He seems incredibly smart and eager to please and is already integrating well with the pack. Sage is an incredible athlete. Some friends stopped by yesterday evening, and we started throwing a football around and found that Sage LOVES football! He was making flying leaps and snagging the ball out of air with ease. It’s easy to see where he’ll get a lot of his exercise ;-) Thanks again for all or your help – we want you to know that we greatly admire the work that you guys do. A child's best friend. Tahoe (formerly Timmy) gets to share toys with his new playmate! Enzo (formerly Oscar), Shep (formerly Drifter) and Amy (formerly Amy) all have been adopted by the same wonderful family. They realized what we've known for a long time: With German Shepherds, you can't have just ONE. I have attached some photos of Reba (Pumpkin) and Wyatt (Peanut) [at 10 weeks, 13 weeks and 5 months] We can't believe that they've only been with us for three months…..it feels like they have always been part of our family and we can't imagine life without them. Can't thank you enough for the important work that you do! Rescue Note: We're so pleased to see how beautiful these little pups turned out to be. "Good Job" as a mommy, Bridgette! Summer (formerly puppy #8) is doing great --she is going to puppy school every Saturday. She loves baskets. If there is a basket, she is in it. She sleeps through the night in my son's room. Rescue Note: The picture of the puppy and son sleeping is one of the cutest pictures we've seen! Ian seems to have only two worries these days: Where to take a nap next and which stuffed toy to snuggle up with. Looks like one spoiled pooch. Just as he should be! Now we have 3 GSDs in our house. As I told you, Nana (Bambi - on the right) is staying with us. Mikoto (Montana) and the girls play hard everyday. Our house is a disaster...., but it is fun! And we believe that this experience helps us when we decide to get one more of your GSDs or foster them. 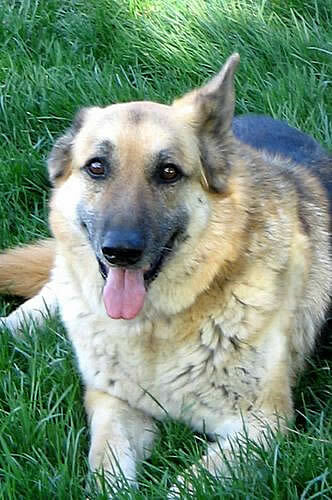 German Shepherds are such wonderful dogs unlike any other breed, but many people do not see that. That is why we want give German Shepherds a 2nd chance. We check your website every single day, hope many of your dogs find a good home every week. Ok Robin, how beautiful is she! She is a MONKEY! Every day is a new adventure. Zoey (Annika) is extremely intelligent, which is great but also scary! Wow ... just ... Wow! was left at the Vet's hospital at the age of 8 weeks by his family to be euthanized because he had Parvo. One of the vet techs called us to see if we can do anything for him. We did, and a few weeks later he was a healthy happy puppy. His new 'mom' came by our adoption event to show what a gorgeous boy he is now at the age of 12 months. We have to agree. Alphie (Alfie) at home seems to be getting comfortable, he is now going up and down stairs without cookie coaxing. Today he went for his first long walk through the wooded trails out back, was very tired but seemed to be happy sniffing at all the new and exciting surroundings. His walk was about a mile, although he did lay down in a grassy area for a few moments to catch his breath. Alphie has grown fond of his celery and carrot snacks with Daddy! He was headed out for his evening walk and decided he wasn't going any further without Dad so we had to make it short. Rescue Note: Alphie is a lucky boy! He couldn't have asked for a more amazing family to adopt him. His new dad Jeff took a 6am flight from New Hempshire to come get him, rented a car in California and drove 2 and a half days back to New Hempshire with Alphie so he would be more comfortable in the car then in a crate on a plane. New parents Marisa and Jeff: Our hats off to you! 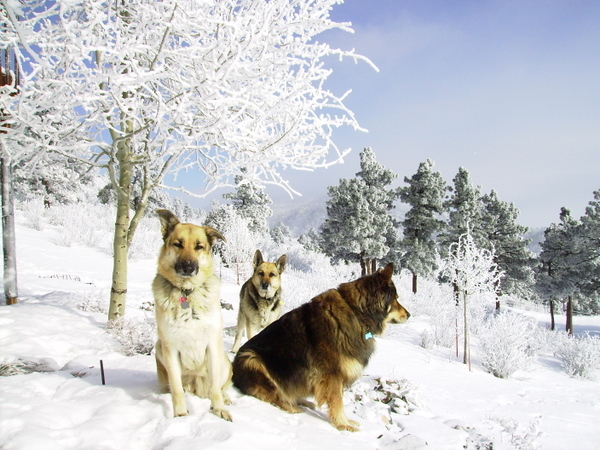 Zurcha (center back) was a "senior lady" when she flew to Colorado to spend the rest of her days in a loving home with her companion Kayla (left). She even made friends with a neighbor, Brutus (right). She spent the last 2 years and 3 weeks of her life in comfort and joy, surrounded by unending love. Our deepest thanks to Carol (her human mommy) for making this possible. Therlough (formerly Dutch von Lancaster) found his final home with a fantastic lady named Joyce. Joyce saw past Therlough's age and old injuries, and she gave him a safe, loving home for his final months. Rest in peace big boy. You are loved. He was a wonderful big brother to Makena (Jenka -left) and will be missed by his family.